Get a free banner and more with your subscription! MLB EXTRA INNINGS SM Mid-Season Offer from DIRECTV is Here on 7/11! Starting on 7/11/16 you can order MLB EXTRA INNINGS SM for your Bar or Restaurant for half of the full season price. This is your chance to draw in new customers that want to watch their favorite team in the drive for the MLB playoffs. With up to 90 out-of-market games each week* on MLB EXTRA INNINGS SM, you are sure to have the games they want to see. The offer is available from 7/11/16 to 9/2/16 and you have to be a DIRECTV for BUSINESS ™ subscriber with a Commercial base package to take advantage of this offer. Call Barry at 800-951-1979 for more information. *Actual number of games varies by market. Blackout rules and other conditions apply. How Much More Profit Can MLB EXTRA INNINGS SM Bring In? Having MLB games on your TVs are definite draws for Bars and Restaurants, but how much profit do they actually bring in? 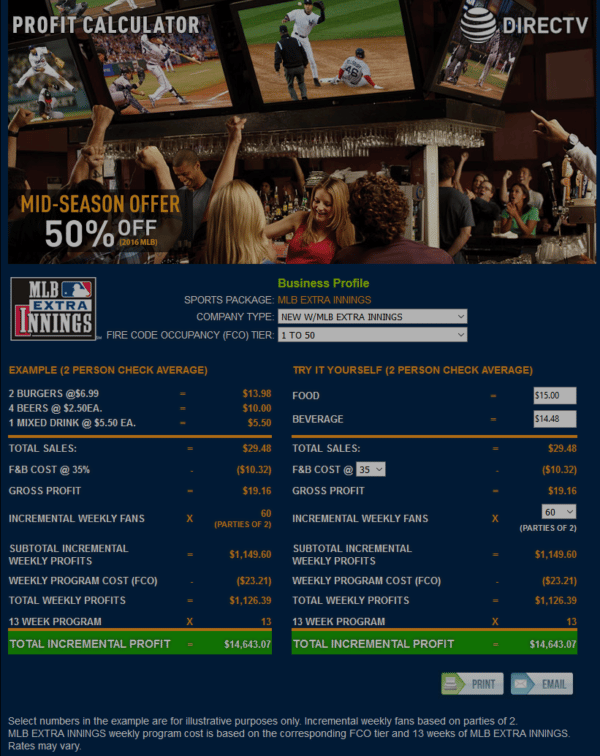 The MLB EXTRA INNINGS SM Profit Calculator from DIRECTV can help you discover how much more profits you can be making by subscribing for your Bar or Restaurant. 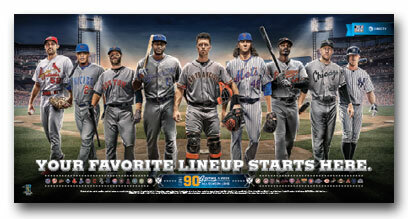 DIRECTV MVP MARKETING Materials for MLB EXTRA INNINGS SM at Half Off! DIRECTV is committed to helping you draw in more customers and they make many marketing materials available to Bar and Restaurant subscribers as part of the DIRECTV MVP Marketing Program. If you are already a DIRECTV for BUSINESS ™ subscriber go to DIRECTVMVP.com for more information about the marketing materials available to you through DIRECTV MVP Marketing.